The Solihull Medical Cosmetic Clinic offers a range of treatments to treat stretch marks. They are often referred to as stria or striae (striae gravidarum during pregnancy). The areas of the body most often affected by stretch marks are the abdomen (tummy), buttocks, and thighs. Stretch marks are often red or purple to start with, and will gradually fade to a silvery-white colour. 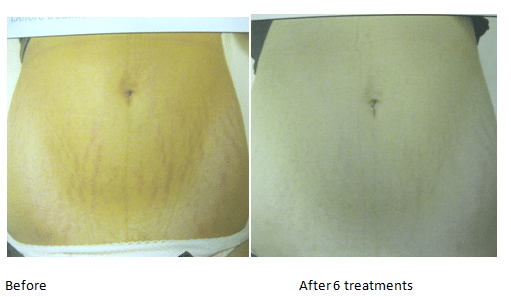 The clinic treats stretch marks using single or combination treatments. Medical Microdermabrasion is a procedure which involves combining positive air pressure and firing pure salt crystals at the skin surface, with the goal being to remove the superficial layer of ‘dead skin’. Unlike inferior dermabrasion machines in beauty salons, the medical microdermabrasion machine that the Solihull Medical Cosmetic Clinic uses is more powerful, and may resurface the skin to a deeper level to optimise results. Unlike a resurfacing laser treatment which is invasive, there is minimal discomfort and redness with no downtime. Dermaroller therapy is a new non-surgical skin regeneration procedure that may help repair and restore the skin’s surface. The procedure uses tiny micro-medical needles, and may help to improve skin damage from ageing, exposure to the sun, pigmentation, acne scars and stretch marks. It tends to be particularly effective against fine lines and wrinkles. Dr. Sagoo is a trained practitioner of dermaroller therapy. The concept behind needling is that it may stimulate new collagen production in your skin. The needle breaks the skin and causes micro-trauma and micro inflammation. Your body responds by sending blood to the area for healing. As your skin repairs itself, new collagen may build up just below the surface. The wrinkles, lines or depressed scars may therefore plump from the bottom-up without the use of anything artificial. Repeated needling sessions may gradually and continually build new collagen to fill in the treated areas. Furthermore, underneath the skin’s surface, much more is going on. In fact, the healing response which begins immediately upon the injury may kickstart a healing process that can last for several months, and up to a year. The natural healing process is where all the magic happens. Carboxytherapy is the administration of carbon dioxide [CO2] gas for therapeutic purposes below the skin through a thin needle. Carbon dioxide is naturally present in our bodies at all times and it is essential to the life processes of both animals and plants. With every breath, we inhale oxygen and exhale carbon dioxide. Plants absorb the carbon dioxide that we exhale and release oxygen back into the atmosphere again. Scars are believed to be caused, at least in part, due to poor blood-flow to the region. By injecting a small amount of carbon dioxide gas into the area, we aim to “trick” the body into increasing the oxygen flow to the area by compelling the red blood cells to pick up all of the excess CO2 that we injected so that it can be carried back to the lungs for elimination from the body with the next exhalation. Carboxytherapy is used to help improve the appearance of dark under-eye circles, stretch-marks, cellulite reduction, and non-surgical fat sculpting on the face and the body. Carboxytherapy can be used on the eyelids, face, neck, arms, stomach, buttocks, and legs. In addition to increasing oxygenated blood-flow to the region injected, carboxytherapy may also increase collagen formation in the skin, giving it a more youthful appearance. Stretchmarks (striae distensae) occur when the skin is stretched to the point where the dermal collagen ruptures. Carboxytherapy may cause the formation of new collagen and may subsequently thicken the skin to improve the appearance of the stretchmarks by rebuilding the collagen matrix. Laser resurfacing using C02 is considered the gold standard in scarring and stretchmark treatments. Using targeted laser energy of a certain wavelength to penetrate in to the deep dermis of the skin, new collagen producing cells may be stimulated and may come to the surface over a period of weeks, which may give improved textured skin and considerably smooth out stretch marks. On average, three treatments are required monthly, for the best chance to give long term permanent improvement. The laser is not suitable for dark skin types. Fractora is the most advanced fractional radio frequency (RF) treatment, which may provide anti-aging improvements to skin tone and texture for a more radiant appearance, through ablation and skin resurfacing. Fractora delivers radio frequency energy to the skin through an array of pins producing localized heat and causing small micro-lesion dots in the treatment area. The gentle heat generated by the Fractora pins in the sub-dermal tissue may promote collagen restructuring for skin rejuvenation and may produce an improved appearance in the skin. The methodical scattering of micro-lesions allows the skin to heal faster than if the entire area was ablated. What this means is that the majority of repair is being done under the skin, maximizing your results, but the damage to the surface is more minimal, allowing you to heal faster and better than with traditional resurfacing machines like Fraxel and CO2 technologies. Dr Sagoo one of the leading cosmetic doctors in the UK is proud to be the first and only doctor in the UK to offer the latest laser in the world for treating white stretch marks. We introduce to you the ExSys Excimer laser. Having undergone speciality training in Germany with leading world renowned experts in Vitiligo; Dr Sagoo can now exclusively offer the excimer laser to the Solihull Medical Cosmetic Clinic the No 1 clinic in the Midlands. The ExSys Excimer Laser 308 nm offers a revolutionary new treatment for patients suffering from vitiligo, eczema and psoriasis. This laser uses a carefully focused beam of light delivered through a sophisticated fiber optic device. The Excimer system allows the practitioner to use high doses of UVB light necessary for fast, effective treatment of the eczematous patches, whilst minimizing the risk of exposure to healthy skin. There is only one technology (Excimer laser) that works by bringing or dragging the cells that hold colour (melanocytes) from surrounding areas to the lighter areas. Although this laser is effective at re pigmenting white stretch marks, patients with lighter skin types may be disappointed with results because they can be inconsistent from person to person, only partially re pigment the stretch marks and have only temporary effects. For further information on stretchmarks treatments and to find out which is right for you please call us on 0845 603 6150 for a free consultation.